I spent the better part of my day wandering around Dave’s neighborhood. He lives in the “old downtown” area of Ulsan so there are lots of shops, restaurants, bars and markets. I mentally bookmarked a lot of places for later explorations. One of my favorite finds was this shop called Funny Love. They specialize in matching outfits for couples and families. 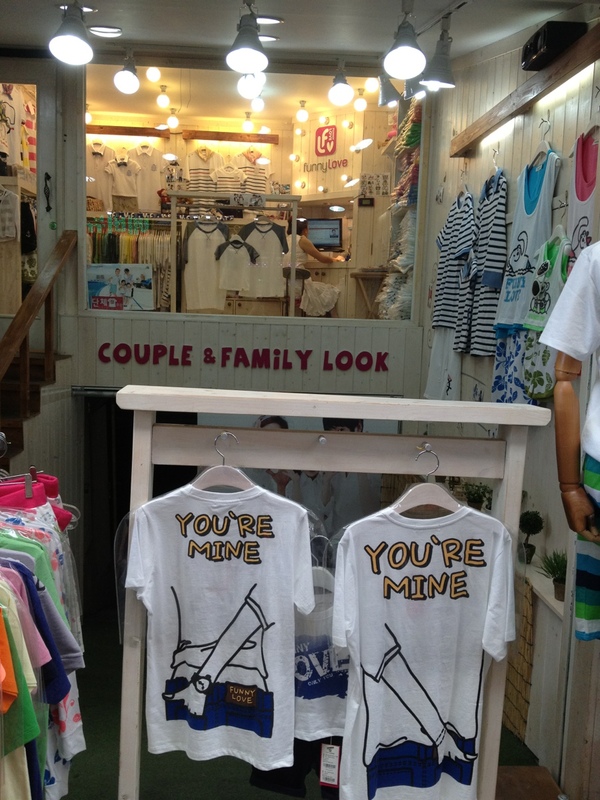 Young couples all across Korea wear matching clothes and I always enjoy spotting “same sames.” I’m sure there are others, but this is the first store I’ve seen that only sells matching clothes. This entry was posted in A year in photos, Shinae/Seongnam by Meagan & Dave | HappilyEverExpat.com. Bookmark the permalink.